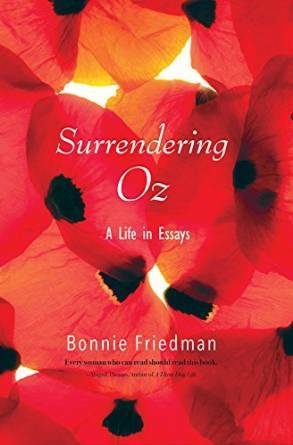 Bonnie Friedman’s Surrendering Oz: A Life in Essays is a deeply personal, deeply intellectual biography set in the frame of a series of monographs. To read it is to watch the author emerge as a newly-winged imago from the chrysalis of socially-enforced unconsciousness. The subtext of this book is at once deeply radical and (retroactively) painfully obvious: society wants to prevent women from knowing themselves, from admitting their desires, because once an individual is aware of their intentions, of the forces that drive them, they can pursue their goals. They can change the world. The essays are written in a highly literary, brightly visual style. Surface things are polished until they reveal reflections of the author’s depths. High windows gleam, fat breasts swell sweaters until the buttons gape, bones peer out through a thin scrim of skin, the severed head of Nostradamus seethes its way across the floor on a black trail of blood. The paragraphs are long, the essays are sprawling, but every word is carefully chosen. Every sentence has purpose, meaning. Nothing, here, is wasted. Later, she states that women are trained to dismiss the truth of their emotions. Society says that emotions are worthless, negligible, because they are feminine. Women are trained in the art of self-sacrifice; they surrender half of their brains for the sake of acceptance without realizing that one needs a whole brain to think. Reason and emotions are two sides of the same coin. One cannot function without the other. Women who give up their emotions, who block out their feelings for the sake of acceptance, are cutting off their own hands. ‘Anagnorisis is the term for an Aristotelian recognition. It marks the moment in a play when the hero comes to a realization about what he’s done, who he is. I read this the next day in the college library while studying Oedipus Rex. My study carrel was beside a Gothic window diamonded with chicken wire. The sky was a blue sword burning overhead. Can there be an anagnorisis involving underpants, I wondered, tears in my eyes. Is that too ridiculous? The philosopher Stanley Cavell, I read on, says that anagnorisis occurs when the hero allows himself an emotional reaction to his intellectual understanding. The two functions had been kept apart during the hero’s quest. While Oedipus pursued the truth of his situation, he couldn’t allow himself to react. He needed to follow the evidence wherever it led—that great detective who in his youth had solved the riddle of the Sphinx itself. But then: the anagnorisis occurs when he permits the emotional reaction, the inner response to the facts he’s unearthed. That’s when he goes wild, blinding himself, gouging out his own eyes with the brooches. Measurable facts are only half the truth. Without emotional understanding the past (the present) cannot ever be fully absorbed. This is not to say that the only valid response to intellectual stimulus is emotional. Friedman is careful to emphasize that one must learn how to think rationally, and she states that organized, rational thinking is a learned behaviour. Without that (taught) skill-set emotions become an all-consuming ocean, waiting to swallow you. ‘A woman who is a gulch is a devouring, appetitive, carnal woman, a torrential woman who will swallow you up into her vacuumous cleft. (She recalls Shakespeare’s weird sisters on the “blasted heath,” that gashed, watery waste whose hags draw their power from arousing taboo cravings.) Kansas’s particular Gulch is an aging spinster, which in the era of the movie meant she occupied a certain realm of death—undesired, sterile and thwarted. And yet, unlike Aunt Em, she pays a lot of attention to Dorothy... In fact, the real, scarcely noticed precipitating event is Dorothy’s decision to go past Miss Gulch’s house on the way home. Couldn’t she predict that Toto would once again invade Miss Gulch’s garden? When a farmhand suggests she simply choose a different route home, Dorothy exclaims, “You just don’t understand.” But what exactly doesn’t he get? That Dorothy wants to explore Miss Gulch’s garden? Friedman was so unsatisfied with the ending of the Oz story, with the death of the witch, because she recognized that the victory Dorothy experienced when she melted her adversary like so much sugar-candy was really a form of society-approved self-defeat. Dorothy ‘won’ by refusing her potential for power. The overarching theme of this book is that, ultimately, it is better to be the a witch. It is better to be passionate, driven, full of ravenous appetite than it is to exist as half-a-creature. These essays (and there are many) expound on a variety of themes but that acceptance of appetite, desire, the howling, hungry voice in the back of your skull, is the thread which binds the book together. This is a collection that I was sorry to finish, and glad to have read.